Some cosplayers make their own outfits. Others shell out cash for them. Japan's largest cosplay costume emporium is Cospa. And the retailer listed its biggest selling outfits of 2011. Westerners might not be as familiar with these costumes as many of them are from adult, Japan-only computer games, light novels, and anime. Some, however, should be familiar. How many do you know? Above, coming in at number ten is an outfit from There's No Way My Little Sister is This Cute. Coming in at number nine is a nurse costume from Macross Frontier the Movie: The Wings of Goodbye, while coming in at number eight and number seven are uniforms from Mashiroiro Symphony and Rewrite. 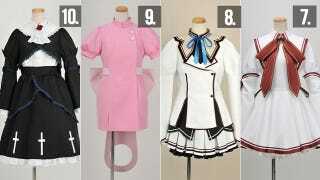 Number six is from YuruYuri, number five is from Shuffle!, and number four is from IS: Infinite Stratos. The top three are all schoolgirl uniforms: three is from Hanasaku Iroha, two is from Toaru Majutsu no Index, and coming in at first place is this K-On1 uniform.